In four large, nationally representative surveys (N = 11.2 million), American adolescents and emerging adults in the 2010s (Millennials) were significantly less religious than previous generations (Boomers, Generation X) at the same age. The data are from the Monitoring the Future studies of 12th graders (1976–2013), 8th and 10th graders (1991–2013), and the American Freshman survey of entering college students (1966–2014). 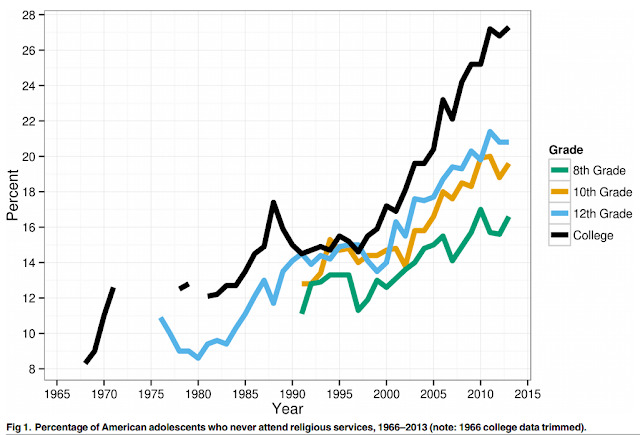 Although the majority of adolescents and emerging adults are still religiously involved, twice as many 12th graders and college students, and 20%–40% more 8th and 10th graders, never attend religious services. Twice as many 12th graders and entering college students in the 2010s (vs. the 1960s–70s) give their religious affiliation as “none,” as do 40%–50% more 8th and 10th graders. Recent birth cohorts report less approval of religious organizations, are less likely to say that religion is important in their lives, report being less spiritual, and spend less time praying or meditating. Thus, declines in religious orientation reach beyond affiliation to religious participation and religiosity, suggesting a movement toward secularism among a growing minority. The declines are larger among girls, Whites, lower-SES individuals, and in the Northeastern U.S., very small among Blacks, and non-existent among political conservatives. Religious affiliation is lower in years with more income inequality, higher median family income, higher materialism, more positive self-views, and lower social support. Overall, these results suggest that the lower religious orientation of Millennials is due to time period or generation, and not to age. It’s common knowledge that many members of the Millennial generation in the United States are rejecting religion. But some analysts argue that, while these emerging adults are less likely to participate in organized religion, they retain an interest in spirituality. Not so, concludes a newly published study. “American adolescents in the 2010s are significantly less religiously oriented, on average, than their Boomer and Generation X predecessors were at the same age,” writes a research team led by San Diego State University psychologist Jean Twenge. Confirming earlier evidence, the study finds they are less likely than members of previous generations to attend religious services, and less supportive of religious organizations. In what may be the largest study ever conducted on changes in Americans’ religious involvement, researchers led by San Diego State University psychology professor Jean M. Twenge found that millennials are the least religious generation of the last six decades, and possibly in the nation’s history. The researchers — including Ramya Sastry from SDSU, Julie J. Exline and Joshua B. Grubbs from Case Western Reserve University and W. Keith Campbell from the University of Georgia — analyzed data from 11.2 million respondents from four nationally representative surveys of U.S. adolescents ages 13 to 18 taken between 1966 and 2014. The distribution of interest at Reddit is interesting. The article was linked to eight times, at the following sub-reddits (in order of popularity of the article within the sub-reddit [as gauged by score]): r/HowGodWorks , r/Christianity , r/lostgeneration , r/UUreddit , /r/theworldnews , /r/NoShitSherlock , /r/atheism  and /r/science . Not only was the article more popular at /r/science, but there were far more comments there as well, so people got involved in discussions about it. So, why was so little interest from atheists? My hope is that it is because many atheists responded to The Raw Story's breathless commentary on Twenge's research in much the same way as I did. By noticing that it's misleading. By noticing that even Twenge's far more restrained abstract is misleading. Let's look at that abstract a little more closely. It is claimed that "twice as many 12th graders and college students, and 20%–40% more 8th and 10th graders, never attend religious services". The next sentence implies that this means as compared to cohorts in the 1960s and 1970s. For anyone with an interest in promoting rationality and secularism, a significant decrease in religiosity in the dominant exporter of culture in this world has got to be good news, right? Well, yes. But this isn't really what is being said here - even if what is being said is entirely true (which I question). Twenge is writing about reported irreligiosity, which in the case of 12th graders and college students has doubled. But double "not very much" is still not very much, especially when compared to more advanced nations. For example, the Christian Research Association estimates that "10 per cent of all Australian young people in secondary school attend" (church monthly or more often) while Wikipedia reports that only 2% of Swedes are reported to be regular attendees at church services. Note however that this Swedish data is more than 20 years old and only refers to one church - when other churches are considered, as reported by the Swedish Institute, "only eight per cent of Swedes attend any religious services regularly". In neither Sweden nor Australia is it possible for irreligiosity to increase by 20%, let alone double. Ignoring the difference between weekly and monthly attendance and using a simple average of the figures for 8th, 10th and 12th graders, this means about 35% of American teenagers are regular churchgoers and the irreligiosity rate is therefore 65%. It is pleasing to see that even in the US, a doubling of this rate is not possible, but an increase of 50% is still possible - to 98%. Using the most recent figures, we can see that about 21% of 12 graders never go to church while 30% attend regularly (weekly or more). That leaves almost 50% who attend "non-regularly", which could mean once a month, only on special days or it might include christenings, weddings or funerals but nothing else. There's potential for a broad scope of belief in that 50%. Overall though, what the research is telling us is that as far as the battle between the religious and the rational in American goes, there is still a long way to go. Which is a bit of a worry. What worried me most however was when I saw an article crowing that the American teenagers "are fleeing religion like never before". Excuse me? Fleeing? How about we compare what is happening with youth and religion in America to the other sort of fleeing that American teenagers are far too often required to do. You know, the sort of fleeing that happens when a gunman enters school grounds and starts shooting at people (I don't want to appear to be overstating the case, so I want to make clear that this has happened only 22 times so far in 2015, at the time of writing). If we were to hear that students fled from a classroom, we would not expect to then read that the number of students absent from the classroom rose from 8% to 27% over a period of more than 30 minutes (and from 25% to 27% in the past two minutes). This is hardly a flood of students leaving. It's barely a trickle. Then there is also the question of what the figures actually mean. Twenge's research is based on survey responses but she makes only one reference to privacy and says nothing about confidentiality. We therefore have no idea about how the respondents would have felt about their freedom to answer candidly. America still has a problem dealing appropriately with youths who are not religiously inclined: there is talk among atheist circles of "coming out", with the same trepidation that a gay person might feel about coming out to their friends and family; there is even a movement called "Atheist Havens" dedicated to providing shelter to youths who are thrown out of home by their religious parents. It's not a huge leap to imagine that some respondents would be disinclined to be entirely candid with respect to the survey. That said, it has become increasingly likely that students who are not religiously inclined might be encouraged to speak openly due to the media attention given to celebrity atheists such as Sam Harris, Richard Dawkins, Michael Shermer and so on. There's no indication that Twenge has controlled for this effect across the years. Therefore, it's possible that the vast majority of what appears to be an increase in irreligiosity in America is merely the effect of increased confidence on the part of those who are not religious and their increased willingness to admit to it. This too militates against any breathless claim that American youth is "fleeing" religion. That said, I don't think that it's all doom and gloom. Increased openness on the part of the non-religious will help provide an environment in which those who are not overly committed to their religion may reconsider their beliefs and perhaps come to see the irrationality of whatever faith they were brought up in. Calmly walking away from religion, even if it's a slower process is a much more dignified approach than fleeing from it. And if it is actually true that atheism isn't growing at the rate that some have been led to believe, this might galvanise proponents of rationality into action, encouraging them to review what they've been doing, to take lessons from the latest research in psychology (particularly about the creation and maintenance of beliefs and attitudes) and to consider whether other approaches might be more suitable. Meanwhile, those of us who are lucky enough to be living in a nation that is relatively free of religion should not rest on our laurels but keep a close eye on those who would have us return to the Iron Age.